In June at WWDC 2016, Tim Cook and Craig Federighi announced new major features and technologies that became available to all Apple mobile devices with the recent iOS 10 release. As Tim and Craig said, the new iOS can bring mobile app development to a new level. 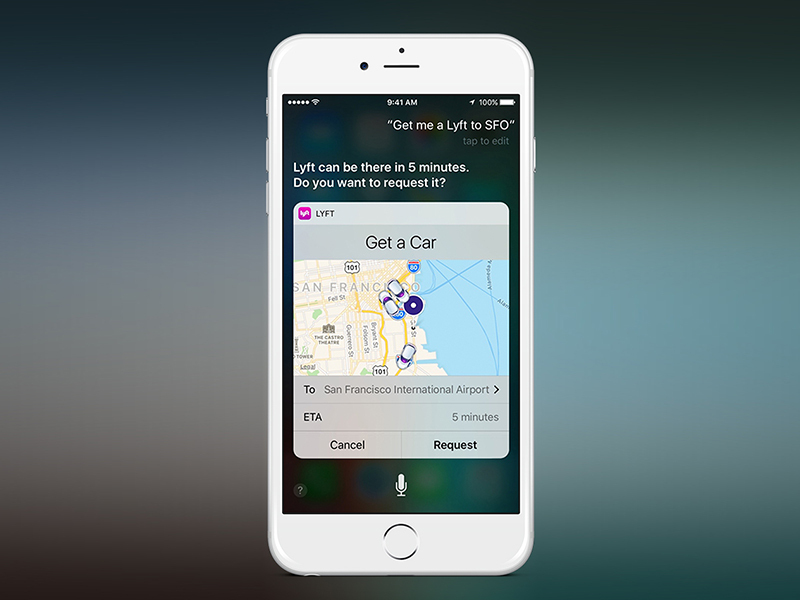 One of the most anticipated updates was expanded functionality for the mobile assistant Siri. And another attractive feature of the release was new ways of sending messages. In this article we look at the system changes that require your attention. These changes can make apps even more engaging and convenient no matter what audience they targeted for – ordinary users or corporate clients. Wonderful news: Siri opens up for third-party apps. Mobile developers can now use the virtual assistant Siri for managing their own apps. VoIP apps that support video and audio calls can use Siri for initiating calls and searching a user's call history. Siri allows messengers to send messages and search incoming messages. Apps that manage photos or videos can use intents to search for photos and videos according to specific criteria or to display a slideshow of content. Using Siri apps that offer user-to-user payment services can send and request payments. You shouldn’t be scared that Siri gets the addressee or the sum wrong as before the money transfer is complete the user can check the accuracy of the operation and confirm or reject a request. Fitness-tracking apps can use intents to start, end, or manage workouts. The virtual assistant allows ride booking apps calling a taxi or freight carriers and get information about cars. Ride booking intents can originate from Siri or Maps. Cars supporting integration with iOS apps can use CarPlay intents so that users can manage automotive systems like audio or climate control through Siri. Users of restaurant reservation apps can use Siri to create and manage their reservations. The Maps app is the only way to make a reservation as it works using the Intents extension of specific apps to resolve any requests. This API requires you to work with Apple Maps before your application can use it. For information on how to get started, please go to http://mapsconnect.apple.com/info/extensions. At present some domains other than the defined categories are not available because Apple does not permit app developers to use their own categories or behaviors. SiriKit can make your app even more convenient for users. If your app is from one of the recommended categories, try to use SiriKit in order to make using the app easier for users. It can save time and increase customer loyalty. Advantages for users are obvious: they can manage apps using voice commands and do more stuff without actually launching an app and digging around. As for app developers, Siri takes charge of speech processing and making an object request with all the data required for an app. *The name of the app is fictitious. Everything that makes it simpler and faster to implement everyday routine tasks helps an app perform better. When users make requests for the app quickly and easily, their engagement increases. We hope that Apple will expand the list of available app categories in future iOS versions for various apps. Apple has changed the design of notifications and created a range of expanded settings that allow developers to manage notifications and add detailed information to the notifications anytime. In addition to text, new notifications can include a title and a subtitle that can help group notification by types. Now notifications can contain audio, photo, video, and other content according to the type and size restrictions. With the appearance of the detail view, app creators can customize their notifications design: include different attachments and use up to four buttons for implementing actions directly within a notification. You can get access to the detail view using 3D Touch or swiping a notification down on an unlocked device. App creators can manage the notifications that are waiting to be sent (for local notifications) or delivered already. This means they can be updated or removed to provide users only with current information. The Notification Service app extension allows modifying content of remote notifications before they are delivered to the user. This extension is invisible for users and works in the background. For example, using the Notification Service app extension you can implement decoding of the notification content before showing it to users with the help of a decoding mechanism in remote notifications. Detail View opens almost unlimited possibilities for customizing notifications. 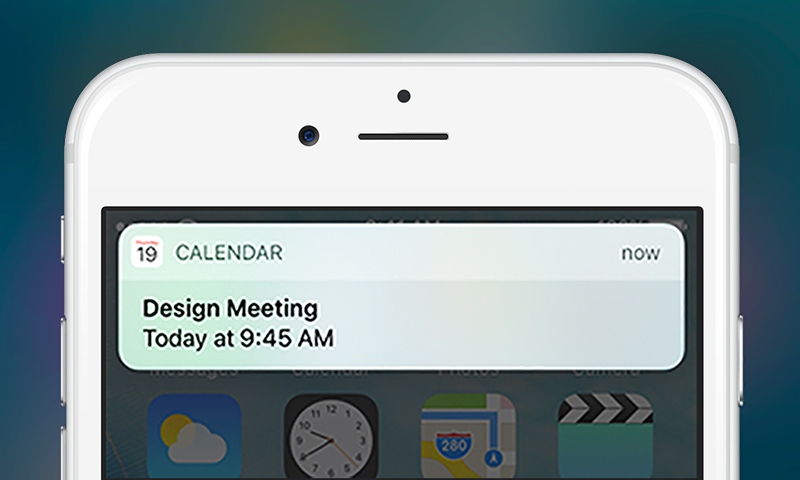 A calendar app can send a notification about an upcoming appointment to the user, including the time, some other important details, and with a Snooze button. The most prominent feature of new notifications is the detail view. This opens almost unlimited possibilities for customizing notifications. Additional details and actions can be accessed simply with one gesture without even running an app. That sounds great! Implementing notifications in active apps is much easier now! Thanks to the new standard notification design there is no need for developers to create something on their own in order to imitate the system behavior. There is a new Speech framework API in iOS 10 for speech recognition based on the same technology that Siri has. The user can process a real-time audio stream from a microphone as well as recorded speech in a file via the Speech framework. Only dictation was available for speech-to-text transformation in prior versions of the system. In particular, users could fill out text fields via a special microphone button on the standard keyboard. 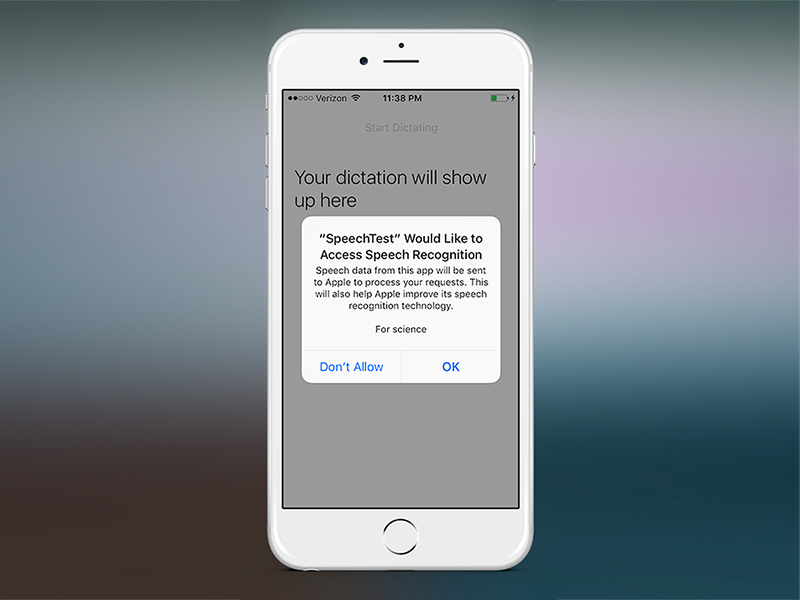 Third-party developers get access to the Speech recognition framework. Mobile developers can customize the view of the appearance and control the process of speech recognition. The recognition results include not only the text but also detailed data, such as alternative interpretations, time stamps, and the confidence level. There are about 50 supported languages and dialects. However, there is a range of conditions for using the framework. While information is transmitted for recognition, it moves into temporary storage in the Apple servers. For this reason, besides access to the microphone, app creators have to receive user permission for speech recognition. Internet access is also required, except for new Apple devices that support using an API offline. The opportunities of Speach Recognition on iOS 10 became much broader. Making speech recognition more accessible can be a big step towards minimizing manual data entry in favor of voice commands. It is extremely important for developers that this feature can be natively implemented without using any third-party libraries. It allows business to increase the audience of their apps by engaging users who have no ability to enter the text manually or attracting those who aim to save as much time as possible when working with a smartphone. Further improvement of the technology has promising prospects regarding the appearance of new apps that are based on speech recognition. For instance, app-translators, services for grammar checks and others. Apple presents Messages – a renewed app for their smartphones and opens up a whole new platform for mobile development. 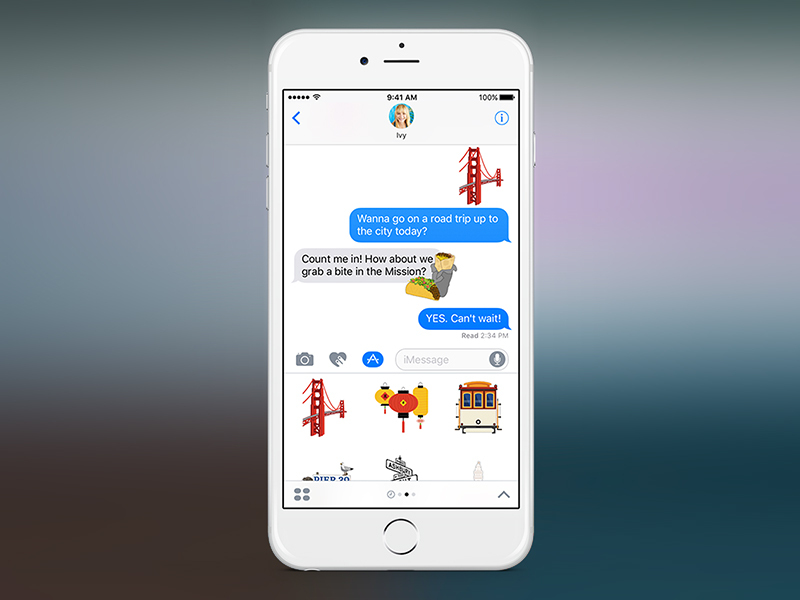 Specifically for users, the updated Messages app includes new stickers, enlarged emoji, animations, reactions, and some other novelties to enrich any chat or discussion. Using Messages, users can share different content, make payments and many other things. Developers can make their own extensions within two existent types. New extension types are appropriate both for standalone use, and in addition to iOS apps. After the iOS 10 release, they will be available in the iMessage App Store built right into Messages. There are three types of content in iMessage apps: interactive messages, stickers, and everything that users had before – photo, video, audio and many others. They look like a set of stickers available to users in the Messages app. Stickers are static or animated pictures that support different formats: PNG, APNG, GIF, and JPEG. For better quality try to use PNG or APNG with respect to limitations. Using Sticker Packs developers can build their own stickers. Custom stickers can be created as standalone apps or as app extension within a containing iOS app. If one of the Messages users sends a message to their friends from the app extension that other chat participants don’t have, a link to your app in the Messages App Store will show up. The conversation participants can tap the link, download your extension from the Messages App Store, and use it later on. These are created inside app extensions and allow users to edit any message they’ve sent. Imagine that you’ve added your own app extension in the Messages App Store and recipients have downloaded it. In this case they get an opportunity to do some actions with app directly from the chat. For instance, using an extension for a meeting organizing app, conversation participants can change the time and agenda without leaving the Messages. 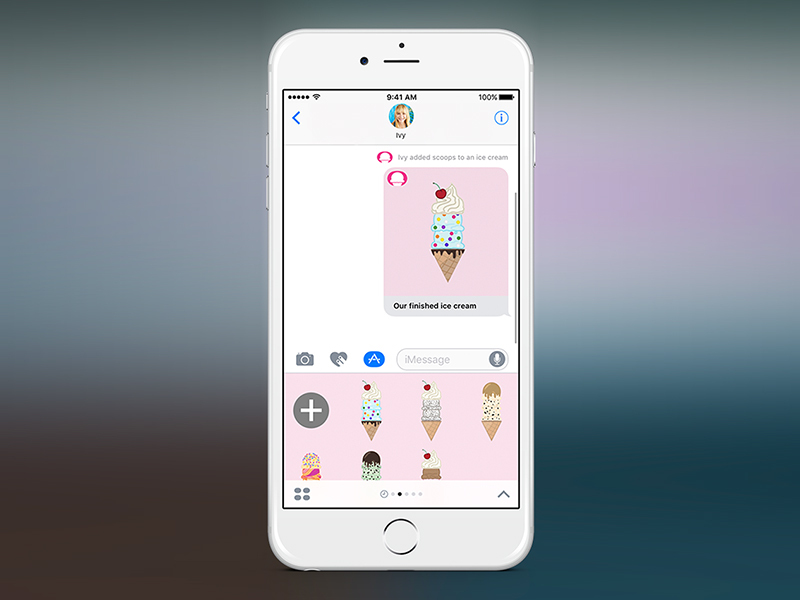 At the WWDC 2016 there was an example when conversation participants created an ice cream sticker choosing the cone, the ice cream flavour, and the topping. Of course it’s not about the ice cream but the idea of users creating a sticker using some preset elements which can be created for any business. Mobile developers can use the same technologies as in any other iOS apps for iMessage development. For example, there are in-app purchases, Apple Pay, and camera. 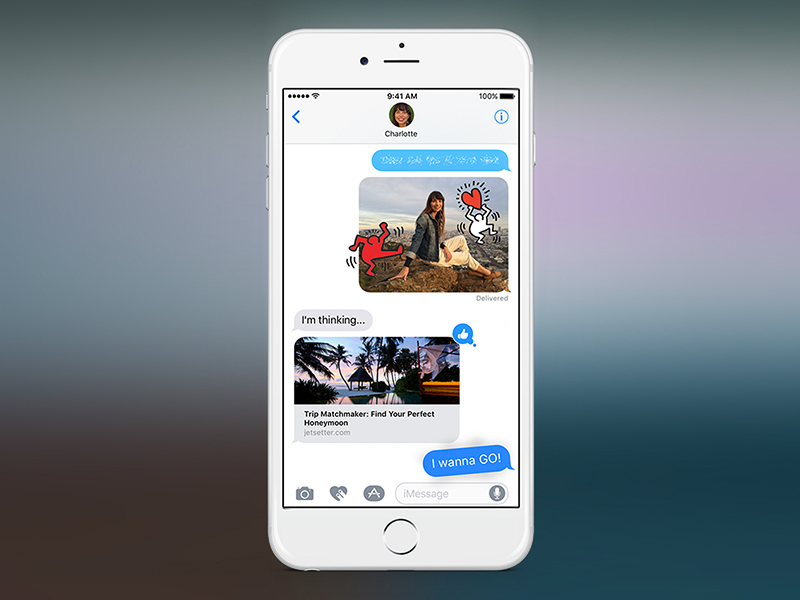 iMessage apps work only with iOS 10, but users can receive the correct content of messages on macOS Sierra as well as on watchOS3. And there is also backwards compatibility. Therefore the earlier iOS versions can receive two simple messages instead of interactive one. The first shows the content as a picture. The second contains a web link. Conversations become alive and more interesting and using the right approach it helps to solve specific tasks quickly and easily via Messages. In particular, it will be helpful in different business apps for joint building complex products or discussing details of some events. Bringing iMessage to Android is not on the table, although this keeps the exclusiveness of the tool for the users of iOS devices. There are new ways in iOS 10 to inform the system about the behavior of users within apps. 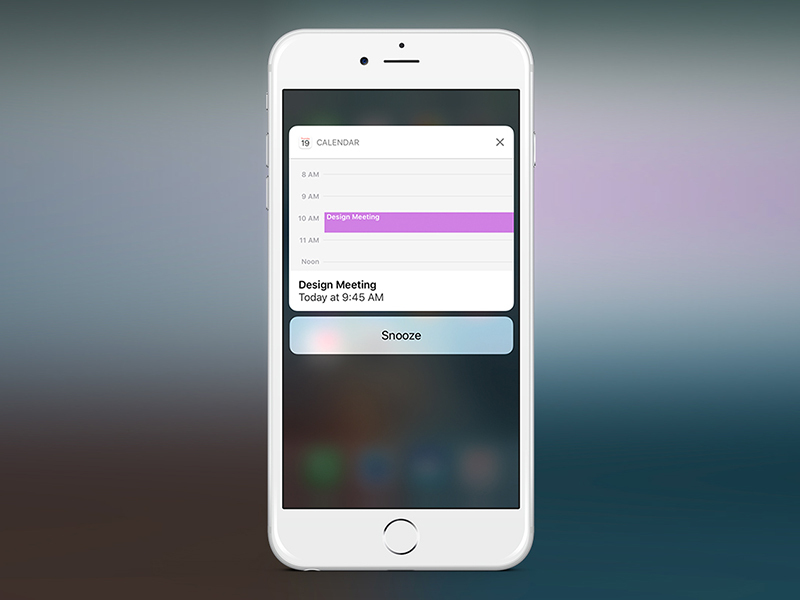 Using Proactive Suggestions the system can show an app to users at the most appropriate time in other words: in the app switcher, on the lock screen, in Maps, or in Siri offers. This positively influences user engagement. Previous iOS versions had similar functionality. When a mobile device was connected to a car Bluetooth-module, the system offered to open apps that are used on a road trip more often, such as a navigator, Podcasts, and others. This feature has been improved in iOS 10. For example, when a user searched for a particular address in Maps and then decided to go there using the navigator, the system will show this address in the hints above the keyboard without the need to enter the entire address again. Proactive Suggestions and Search API: Improvements on iOS 10. The search API in iOS 9 gave users an instrument for searching app content via Spotlight, Safari, Handoff, and Siri. For iOS 10, there are extensions of the Search APIs that provide even deeper search of an app's content. Spotlight is now in the Notification Center and can be seen on the lock screen, which makes it easier to find and use. All these updates speed up the growth of the Search popularity taking into account that 3D Touch allows seeing the preview of search results. In some cases where the user feels a lack of received data or needs additional information, app developers can add to their apps a small but useful tool. So in the upper right corner, the text “Search in App” shows up. By tapping this text, the user moves into the app and continues to search with the same query. If your app already includes the search feature, developers can implement the new feature with a few easy steps. Today we’ve looked at the most noteworthy features of iOS 10. To conclude our review we’d like to mention Apple’s recommendations for app developers. Above all, Apple reminds developers to maintain the high level of quality of apps on the App Store. The company notifies developers that it will remove problematic and abandoned apps without compatibility updates from the App Store. Another important issue – app names. With the release of iOS 10 app names submitted in iTunes Connect for new apps and updates will now be limited to no longer than 50 characters. This means developers need to shorten long app names for more convenient search within the App Store. If you’d like to learn more about creating effective app names, icons, keywords, or screenshots, turn to the App Store Product Page.